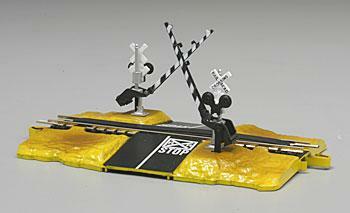 These Crossing Gates are Operating N Scale Accessories by Bachmann. Suitable for Ages 8 & Older. "Looks good, but has issues in use." I just got this installed - no install issues. It operates by depressing a black plate between the tracks. I have tested 4 locomotives over the crossing. The Kato F3 front end was too low to cross, and was stopped as if it hit attack end stop. The Atlas GP9 barely crossed (scraped front end) one direction, and got stopped as above going the other direction. A Bachmann GP 50 did work both ways, as did a Lifelike E8. I have not tried a train yet. My guess is Rapido couplers will be okay, but MTL couplers may be too low and will snag the plate. It looks real nice. It is easy to assemble and install. How well it works for you is unknown. For use with Bachmann E-Z Track and most other brands. Dual action...lower and raise automatically as train passes! This precision-built track accessory is authentic in every detail. No batteries & no wiring required! Realistically detailed railroad crossing signal poles and gates. Track section is molded within a terrain molded base. Nickel silver rail and black molded ties. Adapter pieces for the road help create a smooth incline from your layout up to the tracks. I find the price expensive but it is well made and works well. I do feel the ad should state they do not go well with Kato EZ track, for all us beginners.